Welcome to this episode of the Real Fast Results podcast! Monica Leonelle is today’s special guest. She is an expert on writing, authorship, and publishing. Not only does she teach this stuff, but she does this in her day to day business as well. As a matter of fact, she’s written over a half a million words of fiction, spread across numerous genres and series, most notably her young adult urban fantasy and paranormal romance series, which is called Waters Dark and Deep. Our big, fat promise for today is that we are going to get your book selling. 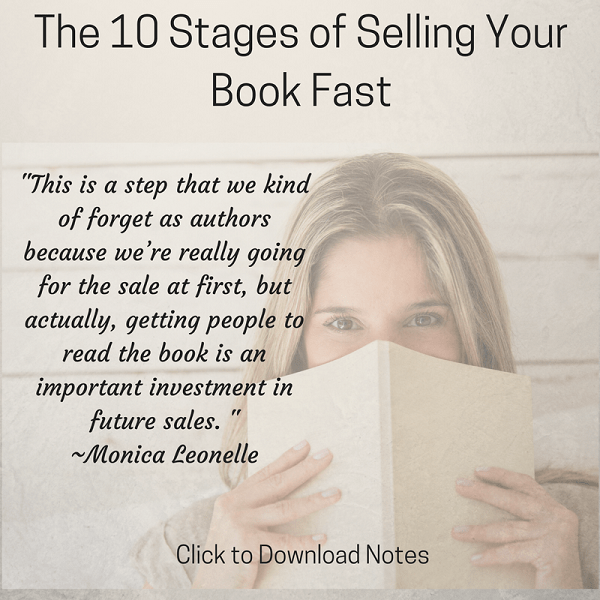 We have this framework called “The 10 Stages of Audience.” This is a clear sales funnel that’s specific to authors and the needs that they have. The first five stages focus on getting readers to your books and getting people to buy them, and the back stages focus on how you can turn your customers into readers, fans, and evangelists of your work. The best way to get in touch with me is through my blog, ProseOnFire.com. If you want to check out my Growth Hacking for Storytellers series, it’s at ProseOnFire.com/ghfs. That will take you directly to Amazon, where you can see all of the books in the series. Get Your Book Selling is out, and it’s at ProseOnFire.com/booksales. Everything that we’ve been talking about, related to the 10 Stages of Audience, is covered in my book. Go check it out. It will help you to brush up on your marketing. I promise that the 10 stages are easy and fun, and once you start to learn about them, no matter how introverted you are or how much of an artist you are, I think you’ll feel a lot more comfortable with marketing your book.